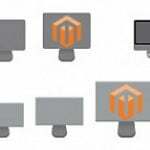 What is the purpose of a Magento PDF catalog extension, you will ask? The answer is obvious: better shopping experience. Create and print a PDF catalog with thousands of products from your Magento 2 store in just a few clicks and provide your clients with it. While a printed catalog is a must have B2B feature, you can fully leverage it your B2C business to promote your store and products. The MageDelight PDF Catalog Print Advance Magento 2 extension allows you to enable catalog printing for both backend and frontend. As a result, not only store administrators can create printed materials, but store visitors also get similar opportunities. Below, we describe the functionality of the module in more details. The MageDelight PDF Catalog Print Advance Magento 2 extension allows to create a fully customizable PDF product catalog. You can select color scheme, theme, and font. It is even possible to select what product attributes to display providing customers with all the necessary information. 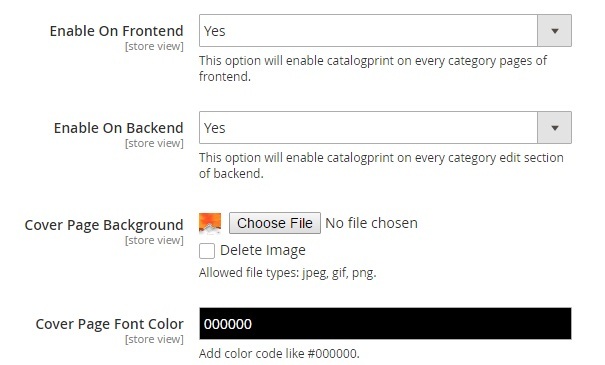 Besides, this Magento 2 PDF catalog generator enables you to create catalogs for specific categories only – this feature is available for both store administrators and customers. As for the aforementioned QR code functionality, it lets you add QR codes to products in a catalog. Thus, you can connect all parts of your business together, providing offline clients with the easiest way to get to the desired product page on your Magento 2 website. They only have to scan an appropriate QR code with a smartphone or tablet and the corresponding product page will be opened. Another vital feature is related to special price and discount support. The MageDelight PDF Catalog Print Advance Magento 2 module allows to create multiple catalogs for the same products but with different prices and discounts. 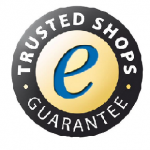 This functionality is based on the support for multiple customer groups. Besides, the same feature allows to restrict catalog generation on the basis of customer groups. And it is also possible to manage catalogs for multiple store views. Now, let’s see what happens under the hood of the MageDelight PDF Catalog Print Advance Magento 2 module. The first section we’d like to draw your attention to is situated under Stores -> Settings -> Configuration -> MageDelight -> Catalog Print Settings. Here, you can fully configure the work of the magento pdf catalog module. The section is divided into 5 parts: License Configuration, General, Fonts, Product List View, and Product Grid View. The first one requires to type serial and activation keys received after purchase. As for the General section, it contains much more options. First of all, you should decide where to enable your PDF catalog: frontend, backend, or both. To enable catalog print on every category pages of frontend and every category edit section of backend, set “Enable on Frontend” and “Enable on Backend” to “Yes”. Next, upload a background image for your cover page and specify a font color for it (add a color code). 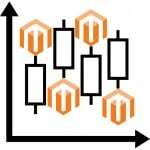 Now, you should decide what attributes to include to your Magento product catalog. Drag & drop necessary attributes from the “All Attributes” column to “Included Attributes”. Note that you can move them back. Add footer text, enable/disable date, and select customer groups to display the “Print PDF Catalog” link to. The last option allows you to make the MageDelight PDF Catalog Print Advance Magento 2 module B2B-specific. To achieve this goal, you should select only “Wholesale” among provided customer groups. In “Products Display”, you can select between two options: “Parent and Child Category Products” or “Only Child Category Products”. Next, choose how to sort products in a catalog: by name, SKU, price, or position. And it is also necessary to select what order to apply: ascending or descending. 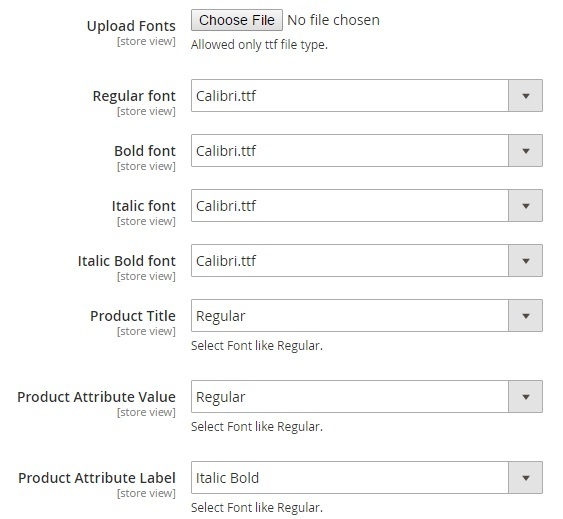 The Fonts section allows to upload custom fonts. Besides, you should specify fonts for regular, bold, italic, and italic bold options. Next, select whether product titles, attribute values, and attribute values should be regular, bold, italic, or italic bold. Note that you can configure each option separately. 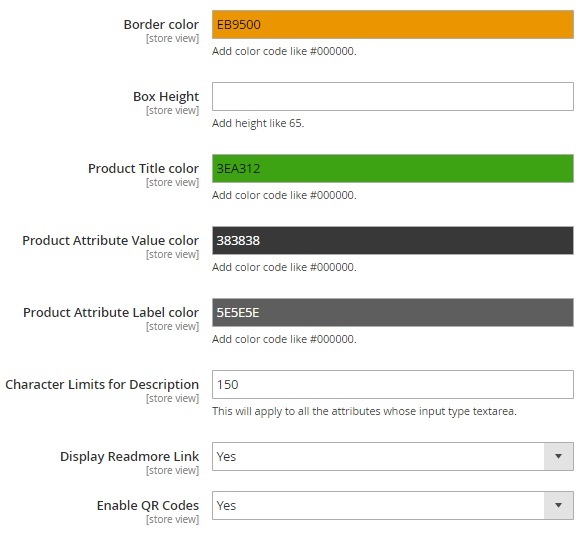 In Product List view, configure various color options, set a limit for product descriptions, and enable/disable “Read More” links and QR codes. 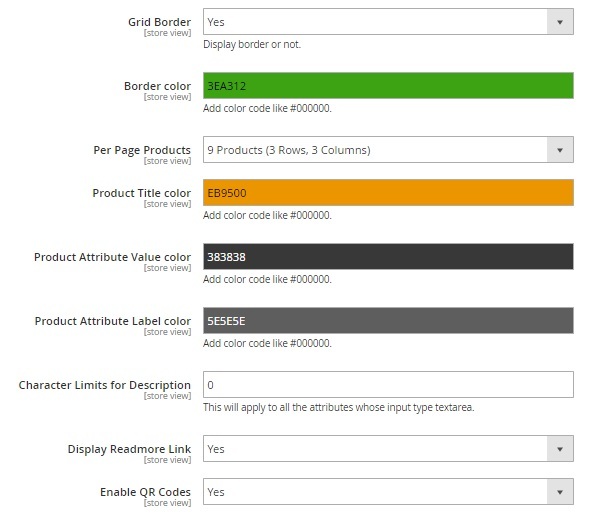 Similar options are available in Product Grid View, but you can enable/disable grid border and specify the amount of products, rows, and columns per page. These were all settings from the configuration section. 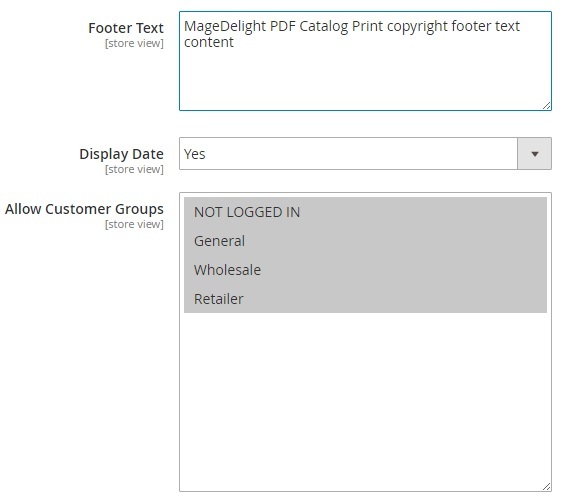 You know how to configure MageDelight PDF Catalog Print Advance for Magento 2, but there are still some options to be explained. Therefore, go to Products -> Inventory -> PDF Catalog Print. This page is divided into 2 sections: Category Selection and Print Options Selections. In Category Selection, tick categories and subcategories you’d like to include to your PDF Magento catalog. Document index by Product SKU in ascending order. Document index by Product Name in alphabetical sorted ascending order. Also note that it is possible to select a store view to generate a store view-specific catalog. Now, let’s find out how to generate a PDF catalog for each specific category. 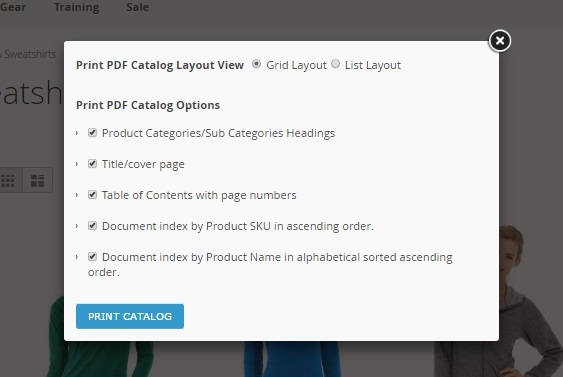 Go to Products -> Inventory -> Categories, select a category from the category tree, and find the “PDF Catalog Print” section. Chose a layout (grid or list) and enable/disable the aforementioned options. Hit “Print Catalog”. As for the frontend functionality of the MageDelight PDF Catalog Print Advance Magento 2 module, it is represented by the same link on every category page. Select a layout and add the following elements: product category and subcategory headings, title and cover page, table of contents, and document index by product SKU or name. Now, click “Print Catalog” and the Magento 2 PDF catalog for this category will be generated. You will be redirected to a new page where the download link appears after the catalog is generated.